WHY: Stubborn makeup, you’ve met your match! 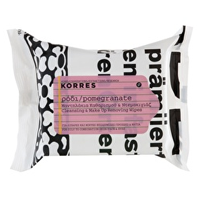 Korres’ refreshing cleansing wipes are the solution to streaks, lip stains, and mascara goop. The cleaning wipes feature antioxidant-rich pomegranate and vitamin E, removing grit and grime while tightening and toning. No more stinging your eyes with skin-burning removers. Your face will thank you!